Here, three great new pestos we’ve spotted recently and how to make them. The first signs of spring have us thinking fresh, green thoughts (see you next year, root vegetables), including how we can turn anything into a bright, herby sauce. It’s still too early for basil, but luckily, chefs are getting creative about turning all sorts of other herbs and vegetables into awesome pesto sauces. Here, three great new pestos we’ve spotted recently and how to make them. 1. 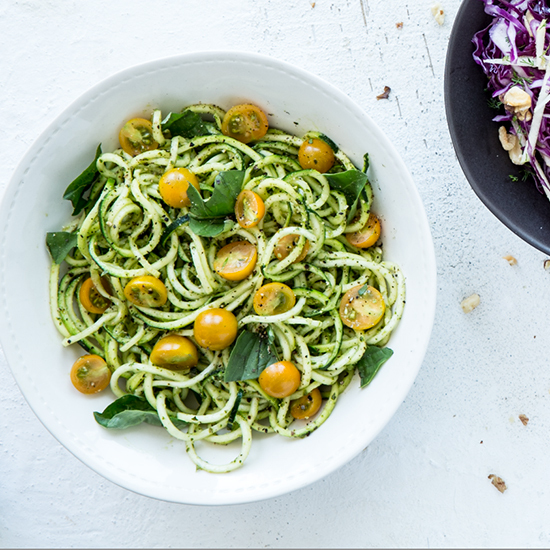 Plant-based San Francisco spot Seed + Salt will serve zucchini pasta with a rich avocado pesto on its summer menu. 2. Dash and Bella blogger Phyllis Grant turns to a simple "clean-out-your-fridge" pesto made with any type of green lurking in the crisper drawer. 3. The pesto sauce adorning the goat cheese ravioli at RPM Italian in Chicago features the ultimate foodie springtime obsession: ramps. Preheat oven to 400°. On a baking sheet, lightly toast nuts for 5-10 minutes. When the nuts are golden and fragrant, remove from the oven and allow to cool slightly. If using walnuts, remove the skins. Drop cloves of garlic into an already running food processor. Add miso paste and lemon juice and process until uniform. Add a drop or two of water or lemon juice if necessary. Add avocado meat, nuts, kale and herbs. Pulse until chopped and incorporated. Add additional oil until desired consistency is achieved. Season to taste with salt and cayenne or black pepper. Blitz the heck out of it all in a food processor. Using a food processor, pulse all ingredients together until smooth. Taste for seasoning and adjust if necessary.